Heat oven to 350°F. Spray 15x10x1-inch pan with cooking spray. In large bowl, cut butter into cookie mix using pastry blender or fork until crumbly; stir in almonds. Press dough in bottom and 1/2 inch up sides of pan. Bake 20 to 25 minutes or until edges are light golden brown. Cool completely, about 1 hour. Meanwhile, in small bowl, beat cream cheese and sugar with electric mixer on medium speed until well blended and smooth. Spread evenly in cooled cookie crust. Top with raspberries. In small microwavable bowl, stir together jelly and honey. Microwave uncovered on High 20 to 30 seconds or until thin enough to glaze. Brush glaze over berries. Refrigerate 2 hours. Cut into 6 rows by 4 rows. 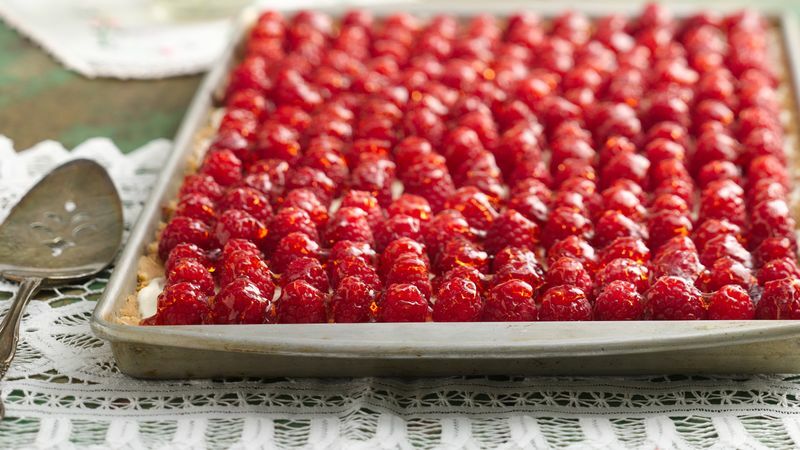 Cover and refrigerate any remaining tarts. Mascarpone cheese can be used in place of the cream cheese. Any berry can be used with the raspberries; try a delicious mix of blackberries, strawberries and raspberries.